The Paola Panthers and Louisburg Wildcats are set to face off with a spot in the Class 4A Division I playoffs on the line. Both teams have already suffered losses to district champion Fort Scott. 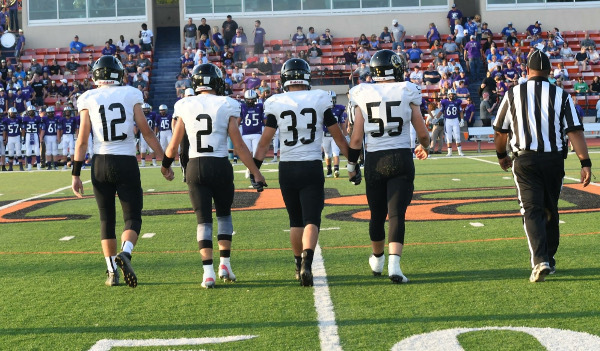 The Tigers nipped Paola 27-26 last week, and they defeated Louisburg 42-20 during the first week of district play. Paola and Louisburg are both 6-2 as both teams also suffered losses to De Soto. The Panthers fell 40-14, and De Soto beat Louisburg 41-0. Last week, Paola fell by one point to Fort Scott after attempting to win the game on a two-point conversion. Panthers running back Colton Gleghorn was stopped a foot short. Glehorn ran for 191 yards in the loss. Louisburg is fresh off a 42-19 win over Ottawa. Austin Moore rushed for five touchdowns in the victory. A year ago, the Wildcats defeated the Panthers 35-7 during the final week of the regular season. Louisburg went on to advance to the second round of the playoffs where it fell 49-6 to the eventual state champion Bishop Miege Stags. Paola will try to return to the playoffs after being absent last year. This game will be for the two playoff berths and district title out of District 6. Smoky Valley has outscored teams 274-102 and ranks third in scoring defense and fourth in offense. Clay Center, against a more challenging strength of schedule according to PPI, has a 232-158 margin. Tim Lambert has achieved his third different turnaround after great success at St. Francis and Concordia. Lambert, a former Smith Center standout quarterback, has long used the same wishbone offense that Smith Center incorporated. Last year, Lambert led a six-win improvement to 8-3 and a quarterfinal showing, its best run since 1998. Last fall, Smoky Valley defeated Clay Center, 30-28, in overtime for the district title, the only meeting between the two teams since at least ‘04. In the first round of the playoffs, the Vikings won again in overtime, 21-20, against Nickerson. Clay Center has earned the runner-up spot for the program’s first playoff berth since ’13. Smoky Valley achieved two other wins by seven points apiece. This year, the Vikings have been much more dominant. Smoky Valley opened with a 24-22 win against Halstead and then lost, 28-14, versus Larned. Since then, the Vikings have won every game by at least 29 points, save a 22-0 victory against struggling Lyons that was significantly curtailed because of weather. Smoky Valley has run the ball on 90 percent of its snaps after it returned every player who had a carry. The Vikings have averaged 5.7 yards per rush, 276 rushing yards a game and 9.7 yards per pass attempt. Even with the shortened game versus Lyons, the Vikings have averaged 54 snaps a game. Senior Kyle Anderson has exceeded 1,000 yards for the second straight year with 146 carries for 1,028 yards and 15 rushing TDs. Veteran senior quarterback Brett Heitschmidt has improved his passing efficiency with 25 of 42 for 412 yards with a 4/1 TD/INT ratio. Five Vikings have at least 37 carries. Smoky Valley has just six turnovers and is plus-five in turnover margin. Last year, the Vikings had 14 turnovers. Clay Center has lost only to 3A powers Phillipsburg and Marysville, teams that have combined for just one loss. Because of a scheduling quirk, Clay Center is coming off of three straight road games and five away contests in its last six. Both of its losses came at home. Record-wise, Clay Center tied Marysville for the North Central Kansas League title with a 4-1 mark. In eight seasons under Todd Rice, Clay Center is 45-41 but has never won more than six games in a fall. Clay Center, with its flexbone, has run the ball on 84 percent of snaps. The Tigers have averaged 5.9 yards per carry, 240 rushing yards a game and 8.3 yards per pass attempt. Seniors Peyton Lane, Levi Pfizenmaier and Caleb Mendum have shared carries. Lane has 109 carries for 686 yards and 12 rushing TDs. Pfizenmaier had 116 carries for 554 yards and three rushing scores. Mendum has 55 carries for 501 yards and six rushing scores. Clay Center has mainly used two quarterbacks and has a 4/7 TD/INT ratio. Overall, the Tigers have 16 turnovers and stand at plus-2 in turnover margin. Clay Center has averaged 49 snaps a game. Both of these teams have great running games. However, Smoky Valley turns the ball over less, has had a stronger passing attack and a more explosive running game. The Vikings control the clock and get the road win. Riley County visits Marysville with the District 13 championship on the line. Both the Falcons and Bulldogs have already qualified for the playoffs, but this game carries significance given the outcome will decide their first-round playoff opponents. The loser of this game qualifies as the district runner-up and will travel to No. 2 Phillipsburg to open the Class 3A playoffs. The winner earns a home playoff game against either Norton or Thomas More Prep. Both teams have rolled to seven-win regular seasons with each having lost a game to a league opponent. Marysville opened 3-0 before a 22-16 loss at Concordia in Week 4. Riley County opened with five consecutive wins before being beaten by Silver Lake 41-14 in a game that decided the Mid-East League championship. Coach Steve Wagner’s Riley County Falcons are paced by a run-heavy offense that averages 336 yards per contest. The Falcons are led by senior quarterback Tyler Halstead. Halstead has rushed for a team-high 865 yards and 13 touchdowns, and passed for 215 yards and four scores. Junior Mikey Waggoner is second on the team with 697 rushing yards and nine scores, while Ty Nelson has added 480 yards and seven touchdowns. Junior Luke Richard and senior Zain Geier pace the Falcon defense with 32 and 31 tackles, respectively, while Nelson has four interceptions in the secondary. Marysville has shown great offensive balance behind a breakout season from senior quarterback Jack Blumer. Blumer has passed for 1,893 yards and 24 touchdowns against only two interceptions. He’s also added a team-high 598 rushing yards and 11 scores. Blumer’s primary receiving target has been senior Gabe Pieschl who has 37 receptions for 890 yards and 12 touchdowns. Juniors Jacob Backus and Derek Roever add 375 and 208 receiving yards, respectively. Sophomore Atreyau Hornbeak is second on the team to Blumer in rushing with 356 yards and five scores. The Bulldog defense has been efficient in forcing 14 turnovers this season. They’ll need a discipline defensive approach against Riley County in order to claim the district title and a home playoff game. The Olpe Eagles and Lyndon Tigers will meet for the Class 2-1A District 3 championship. Last year, the two teams met under slightly different circumstances. Lyndon entered with an 8-0 record, but Olpe had its back against the wall after a 14-7 district loss to Chase County. Olpe beat Lyndon 26-20 and advanced to the playoffs as the district runner-up. The Eagles are on a three-game winning streak against Lyndon, last falling 27-25 in 2013. Olpe opened the season with a 1-2 record after losses to St. Marys and Osage City, but the Eagles enter on a five-game winning streak. Last week during a 44-6 win over Northern Heights, Olpe allowed only 124 yards of total offense. Freshman Kynden Robert scored three rushing touchdowns. Garrett Pimple caught a TD pass and also returned an interception for a touchdown. While Olpe fell to Osage City, Lyndon earned a 30-17 win over the Indians. Lyndon has outscored its two district opponents by a combined score of 90-6, while Olpe won those games 84-6. The Tigers’ offense is directed by senior quarterback Jamie Reed, who has passed for 1,189 yards and 20 touchdowns and only two interceptions. Senior Dexton Swinehart is one of the most versatile talents in the state. He’s rushed for 1,187 yards and 23 touchdowns on only 94 carries. He’s also caught 30 passes for 730 yards and 12 touchdowns. He’s even completed 7 of 7 pass attempts for 99 yards and a touchdown. On defense, Swinehart has recorded three interceptions. Hodgeman County travels to Otis-Bison to decide the two playoff berths out of District 6. Both of these teams spent part of 2016 in the Division II rankings but eventually fell out and missed the playoffs behind state runner-up Dighton and semifinal participant Wallace County. This fall, Otis-Bison and Hodgeman County own victories against Dighton and Wallace County and have earned postseason berths. District 6 is the lone Division II district that will have different playoff participants in 2017 compared to 2016. Otis-Bison sufferred close losses to Central Plains, Wallace County and Dighton in 2016. This year, The Cougars fell 36-12 at Central Plains in a Week 3 non-district contest that was tied at halftime. In Week 4, Otis-Bison earned a marquee home win, 22-20, against Victoria, and then beat Wallace County, 70-24, the following week. The Cougars tallied 34 third-quarter points and defeated Dighton, 54-8, in Week 8. The Cougars have received a superb season from junior quarterback Anton Foust, a big dual threat presence. He has completed 32 of 51 passes for 579 yards with a 12/1 TD/INT ratio on one of the state’s smallest rosters. Foust has a team-high 75 carries and ranks second with 587 yards and 11 rushing scores. Senior Blake Bahr has 56 carries for 752 yards and 16 scores, the latter two leading the team. Senior 5-foot-9, 285-pounder Landon Hoopingarner, a three-year starter and healthy this season, has led the line play. Junior Luke Higgason is a three-year starter on the line, too. Otis-Bison has averaged 9.8 yards per rush and 10.2 yards per play. Otis-Bison has collected 17 turnovers. Last year, Otis-Bison averaged 7.9 yards per rush and 8.1 yards per play with just 11 turnovers forced. The Cougars have received improved defense from 2016 with an average score of 48-11. Last season, Otis-Bison went 6-3 with an average score of 46-24. The Cougars are 4-0 at home this season, have won six straight at home and 10 of its last 12. The Longhorns have also improved following a 5-4 record in 2016 that had an average score of 42-29. Hodgeman County has an average score of 47-15 this year. The Longhorns lost standout linebacker Luke Shiew, the team’s leading tackler in 2016, to a career-ending neck injury in Week 1. Like Otis-Bison, Hodgeman County lost an elite Division I team (Spearville 64-34 in Week 2) and owns a signature win versus a Division I squad (at South Central, 30-27, in Week 4). Hodgeman County has received steady quarterback play from senior Jacob Salmans and freshman Isaac Salmans. A four-year starter, Jacob has completed 39 of 68 passes for 632 yards with a 5/3 TD/INT. Isaac has 12 of 18 for 304 yards with six scores against no INTs. Jacob missed two games earlier in the season but passed efficiently in wins against Wallace County and Dighton the last two weeks. Sophomore Eli Salmans has 128 carries for 889 yards with 16 rushing scores. The Longhorns have averaged seven yards a carry and eight yards a play. Senior Treyton Coats has stepped up and led the defense with 83 tackles for a unit that has forced 15 turnovers. Entering this year, Coats had 79 tackles in his career. These are likely the top-two teams on the west side and could meet up again in the sub-state title game. Credit Hodgeman County for putting together a solid season and a big improvement defensively without Shiew. Foust has helped key Otis-Bison’s season and is very difficult to tackle because of his 6-foot, 190-pound frame. The Cougars, playing at home, get the win. All season, these two have rolled through their schedules and delivered great offensive numbers. Last year, Central Christian’s first as a KSHSAA school after many years as a club team, the Cougars went 9-2 and lost to Hanover in the second round of the playoffs. Both Caldwell and Central Christian fell to Hartford in district play before the Cougars defeated the Bluejays, 58-12, in Week 9. Caldwell missed multiple starters in that contest, including standout quarterback Colten Ward. This year, the Bluejays and Central Christian meet for the two playoff spots out of District 2. Caldwell has outscored teams 442-80 and ranks third in scoring offense and defense against the classification’s No. 29 strength of schedule out of 48 teams, according to Prep Power Index. Central Christian, which led all of eight-man in points per game in 2016, has a total margin of 564-120. The Cougars again pace eight-man football in total points by a healthy margin. Division I Burlingame ranks second with 466 points. Central Christian has played the easiest SOS in eight-man football. While the teams have several common opponents, Caldwell has a couple of marquee victories, most notably 38-20 at home in Week 2 against Argonia-Attica. The Titans are 6-2 in Division I. Caldwell defeated Udall and Central Burden, both 4-4 in Division I. Central Christian’s top opponent is 6-2 Pretty Prairie. In Week 1, the Cougars won 90-38 at Pretty Prairie. Since then, Pretty Prairie has permitted just 114 points. Central Christian has received offense from a variety of players, including receiver Richie Oswalt, Marshall Walton, Garrett Burns, and senior quarterback Nate Heneha. Freshman signal caller Dawson Urwiller has played well in a backup role. Through the season’s first five games, Heneha averaged 21.4 yards per carry with nine rushing scores on just 26 carries. The Cougars list 19 players on the roster after just 13 last season. Caldwell lists 28 on the roster. Junior Corbin Rice has thrown for more than 670 yards, including four touchdowns last week against South Haven. Senior Dakota Volavka has more than 560 rushing yards, and junior Jalen Risley is a big playmaker with over 500 receiving yards. Risley scored on three of his catches last week. Central Christian, mainly based on last year’s win and Heneha, have been the higher ranked team. However, Caldwell has more depth, been battle tested and has plenty of weapons. The Bluejays win a high-scoring contest.